Ricardo Piglia’s Target in the Night is out now! In other cool news, the translator of Target in the Night, Sergio Waisman, will be in Texas in early January, and we are hosting the inaugural Deep Vellum Book Club in our new bookstore (more on that below), where Sergio will discuss the inner workings of this amazing novel. Join us, January 5th, at Deep Vellum Books in Dallas, and then on January 6th at Brazos Bookstore in Houston!! Deep Vellum Books will be located in a 900-square-foot space at 3000 Commerce St., according to the Dallas Morning News. Besides Deep Vellum’s books, the store will stock indie-published titles, including fiction, nonfiction, poetry, handmade books and literary journals and magazines, with an emphasis on translation. Altogether it will stock 2,000–3,000 books. So if you’re an indie publisher, or live in Texas and make awesome chapbooks or zines, get in touch with us & send us some books so we can have you in stock for our grand opening! 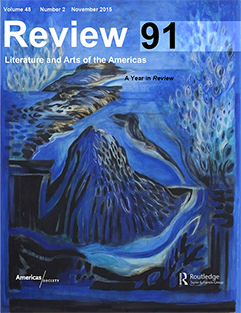 Speaking of Latin American literature from before, pick up the new issue of REVIEW: Literature and Arts of the Americas (issue #91), published by the Literature Department at the Americas Society, for a remarkable review ofCarmen Boullosa‘s Texas: The Great Theft by the legendary Dr. Nicolás Kanellos of the University of Houston & Arte Publico Press, plus Juan Villoro has a piece on Sergio Pitol, and Rafael Lemus reviews Sergio Pitol‘s The Art of Flight. Check it out! And for those who read & love the TLS (Times Literary Supplement)—like our friend Jerome Weeks over at KERA’s Art & Seek—both Sphinx and Tram 83 were reviewed by this prestigious Lond0n-based literary outlet in the past month, further proof that one can actually publish great books in a place like Dallas, Texas and bring the world into dialogue with Dallas from Dallas. Reminder: subscribe for 5- or 10-books today to get your name in the back of Lina Meruane‘s searing novel Seeing Red, coming out in February (and to subscribers in January! ), or make a year-end tax-deductible donation to support Deep Vellum (your name will be included in the back of the books we publish as our way of saying thanks if you subscribe or donate!). The next book subscribers will receive is Jón Gnarr’s The Pirate, the followup to his The Indian, which we published in April, all about how young Jón got into punk & anarchism & how it saved his life, chronicling the birth of the political and philosophical awareness and compassion of the man the world knows and loves today.